Grease twelve 2 ½ inch muffin cups or line them with paper bake cups. 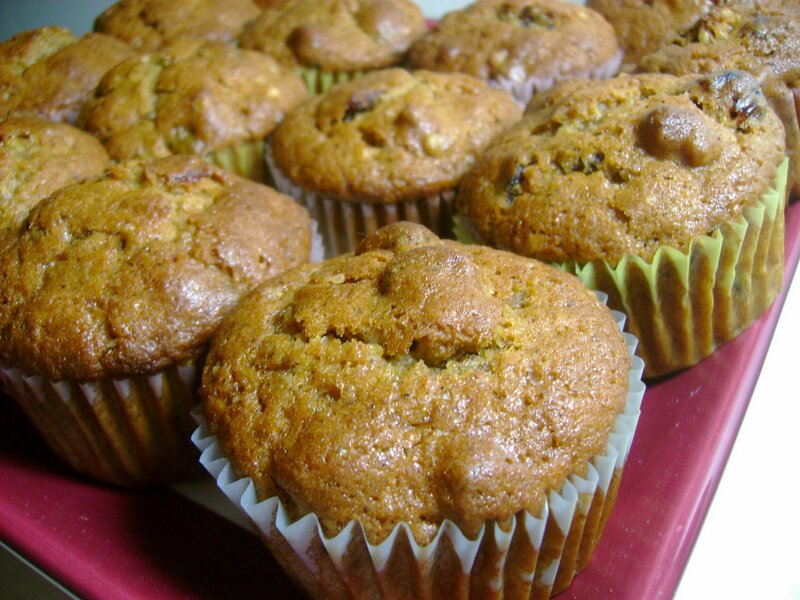 Set muffin cups aside. In a small bowl stir together 3 tablespoons brown sugar and sour cream. Stir in pecans. Set aside. In a medium mixing bowl stir together flour, baking powder, cinnamon, baking soda, nutmeg and cloves. Make a well in the center of the dry mixture. In another medium mixing bowl, stir together egg, buttermilk, pumpkin, 2/3 cup brown sugar and melted margarine. Add the pumpkin mixture and dried cranberries all at once to the dry mixture. Stir just until moistened. Spoon batter into the muffin cups, filling each ¾ cup full. Drop 1 tsp. of pecan mixture on top of each muffin. Bake in a 400 degree oven about 20 minutes or until done. Cool slightly, and serve warm. As I was shopping at my local Whole Food’s Grocery store, I was inspired to bake after coming across their beautiful bakery case. The case was filled with scrumptious looking fruit tarts, fluffy layer cakes, deep chocolate brownies… it was enough for me to hit the kitchen and bake something myself. The question was, what should I bake? Looking at the random ingredients I had on hand and stashed away, it became clear the thing to make was Brooklyn Chocolate Blackout Cake. I decided to adapt the recipe from The Best of America’s Test Kitchen: Best Recipes & Reviews 2008 (pg 62). This chocolate layer cake is unique in that the chocolate pudding filling doubles as frosting and the entire cake is covered in reserved chocolate cake crumbs. Heavenly! Here’s the recipe… enjoy! 1. Cook the granulated sugar,, chocolate, half & half, milk, cornstarch and salt in a large saucepan over medium heat, whisking occassionally, until the chocolate is melted and the mixture begins to buble, 2 to 4 minutes. Stir in the vanilla. Transfer the pudding to a large bowl and refrigerate, with plastic wrap pressed flush against to surface, until cold and set, at least 4 hours or up to 24 hours. 1. Adjust an oven rack to the middle position and heat the oven to 325 degrees. Grease and flour two 8″inch cake pans. Whisk the flour, baking powder, baking soda, and salt together in a medium bowl. Melt the butter in a large saucepan over medium heat. Stir in the cocoa and cook until fragrant, about 1 minute. Off the heat, whisk in the coffee, buttermilk, and sugars until dissolved. Whisk in the flour mixture. Divide the batter evenly between the prepared cake pans and smooth with a spatula. 2. Bake until a toothpick inserted into the centers come out clean, 30 to 35 mintes, rotating the cake pans halfway through baking. Cool the cakes in the pans for 15 minutes, then invert onto a wire rack. Cool the cakes to room temperature before frosting, at least 1 hour. 1. Using a large serrated knife, slice each cake into 2 even layers. Crumble 1 cake layer into medium crumbs and set aside. Place 1 cake layer on a cake plate or cardboard round. Spread 1 cup of the pudding over the cake layer and top with another layer. Repeat with 1 cup more pudding and the last cake layer. Spread the remaining pudding evenly over the top and sides of the cake. Sprinkle the cake crumbs evenly over the top and sides of the cake, pressing lightly to adhere the crumbs. Slice and serve. This cake is extremely dense, creamy and rich. Be sure to have coffee or a glass of cold milk on hand! The fall season is upon us and I was in the mood for comfort food. What’s comfort food to me? 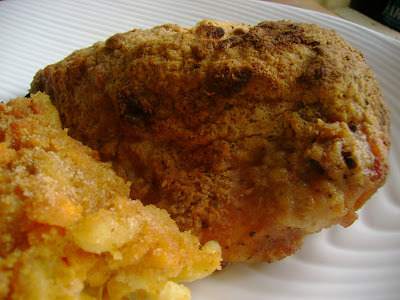 Fried chicken with mac & cheese of course! In a bowl, place chicken and pour buttermilk over it to cover. Allow chicken to marinate it the buttermilk for at least 30 minutes (this is a great way to tenderize the chicken). Remove chicken from bowl and shake off excess buttermilk. Season chicken with garlic powder, onion powder, salt & pepper. Next, apply the BBQ rub all over the chicken. Combine flour and breadcrumbs in a separate bowl. Dredge chicken in flour/breadcrumb mixture. Place on baking sheet & bake in preheated oven for 30-45 minutes or until juices run clear, depending on chicken size.